The adorable little girl with the big hat seen in this cabinet card was photographed by a talented and well known celebrity photographer by the name of Charles DeForest Fredricks (1823-1894). Look below and note the fancy advertisement placed on the reverse of the photograph. Fredricks had an interesting career and to view more of his images and to learn more about him, click on the category “Photographer: Fredricks”. This portrait features an attractive unidentified actress. This woman seems to love texture. Note the fabrics she is wearing. She has a wonderful feathered hat and a shaggy stole. At least I think its a stole but I am uncertain and welcome intervention from a cabinet card gallery visitor knowledgeable about woman’s fashion. The woman looks quite handsome in her high collar dress and lovely accessories. The photograph was taken at Fredricks Knickerbocker Family Portrait Gallery in New York City (770 Broadway). To learn more about Mr. Fredricks and to view more of his images, click on the category “Photographer: Fredricks”. 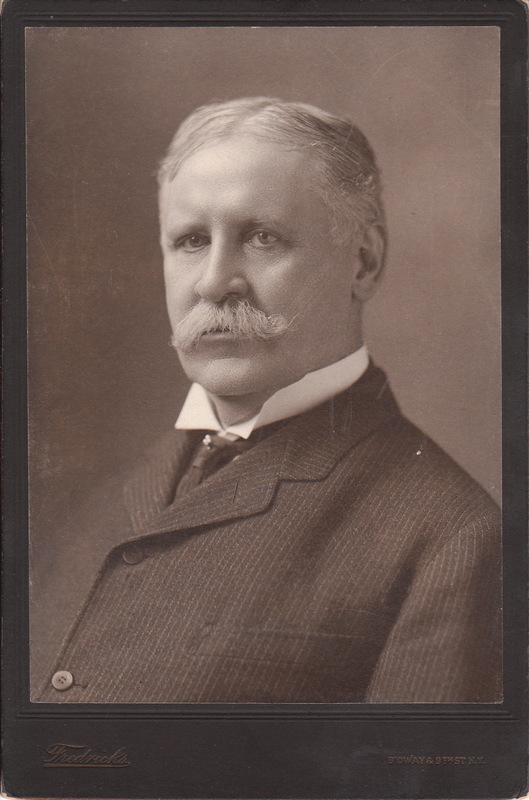 This cabinet card portrait features Rufus Billings Cowing, New York City Judge and Wall Street lawyer. The photograph was published by Fredricks whose studio was located at Broadway and Ninth Street in New York City, New York. The New York Times (1906) reported Judge Cowing’s retirement from the bench of the Court of General Sessions. He had served for 28 years and had been involved in some sensational criminal and political corruption cases. His career was intertwined with the history of New York City. After leaving the courts, he entered private practice by joining his son’s firm on Wall Street. Cowing was born in Jamestown, New York in 1840. Cowing’s father died when Cowing was just 5 years old. At age 12, he came to New York City where he attended boarding school until he entered the Polytechnic Institute in Brooklyn from which he graduated in 1861. Next, he clerked at a bank for a short while and then decided to enter a law career. He worked for and studied at a New York City law firm for about two years and then entered Harvard University’s Law School, graduating in 1865. He practiced law in New York City and got involved in politics. He had an unsuccessful run for an assembly seat in 1875. He ran as a Republican in a heavily Democratic district and nearly won. Cowing was married twice and had children from both unions. He was married to Hester Tugnot (1866) and Marie Ling (1901). Cowing died in 1920. Charles DeForest Fredricks, the photographer of this image, was a well known New York City photographer who was known to have photographed many celebrities during his career. This risque (lots of cleavage shown for this era) cabinet card is a portrait of Pauline Markham (1847-1919), a singer and burlesque dancer during the civil war period in the United States. She was born in England where she made her stage debut as a child. She came to New York and appeared in “Black Crook” and “Pinafore”. 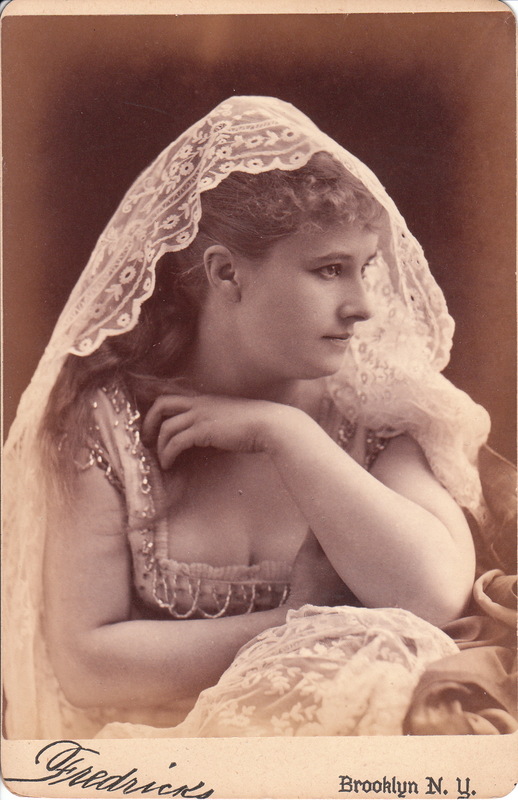 She was a member of the Lydia Thompson troupe (British Blondes). 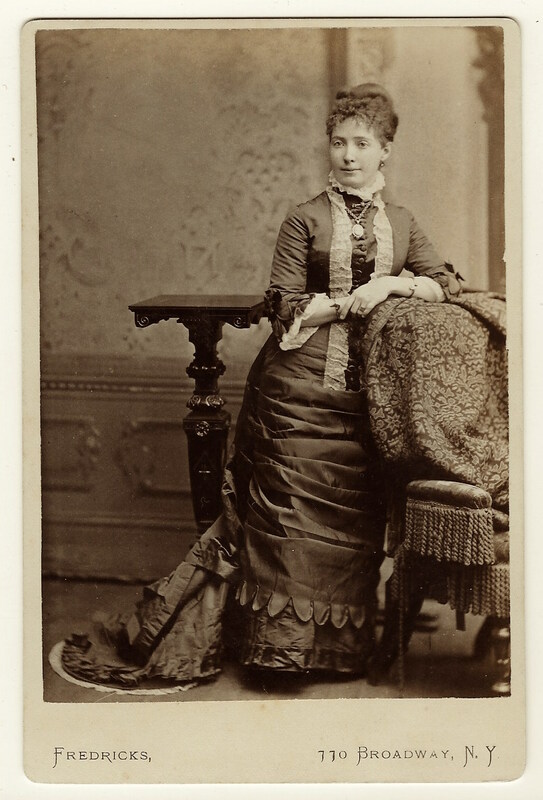 After the civil war, she had relations with Northern Generals and Reconstructionists In the 1870’s she formed her own stage company and in 1879 she took her company on a tour of the West during which they performed Gilbert and Sullivan. 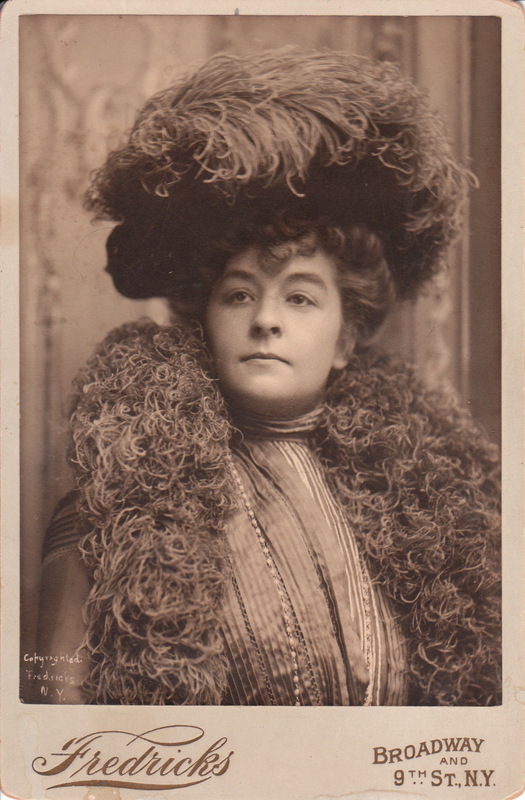 A member of that troupe was Josephine Marcus, who later married lawman, Wyatt Earp. She retired from the stage in 1889 after breaking her leg. She must have taken the old show business saying of “break a leg” literally. This cabinet card was photographed by Fredricks, of Brooklyn, New York. It is possible that the photographer is Charles DeForest Fredricks (1823-1894) who was an innovative American photographer. 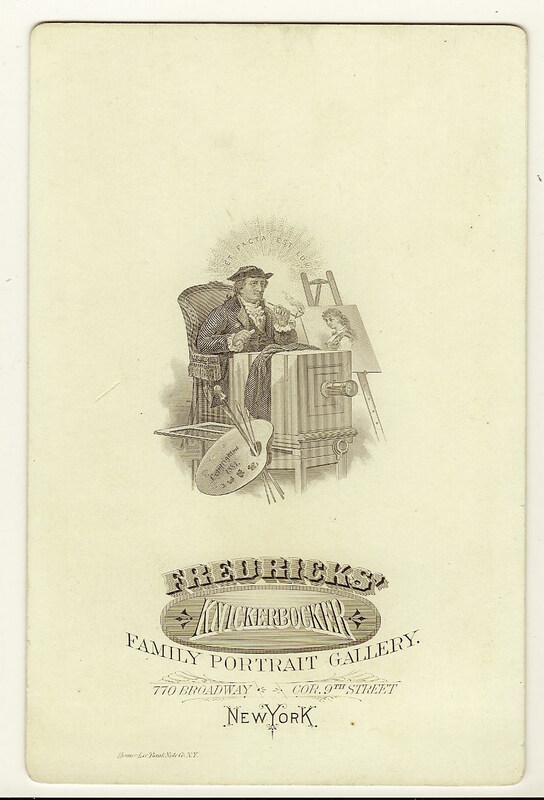 Fredricks learned the art of daguerreotypes from the great photographer , Jeremiah Gurney (see category “Photographer: Gurney”). Fredricks worked in South America through the early 1850’s and then he operated out of Charleston, South Carolina; and Paris, France. He was the first photographer to make life-size portraits, which he then hired artists to color them using pastel. He then returned to New York City and rejoined Gurney. In 1854 he developed a new enlarging process and in 1855 he ended his association with Gurney. In the late 1850’s Fredricks ran his studio in Havana, Cuba, and in the 1860’s he opened a studio on Broadway, in New York City. He retired in 1889. Research has not confirmed that Fredricks ever had a studio in Brooklyn, so it is quite uncertain whether the Fredricks who photographed Markham is actually Charles D. Fredricks.